Treatment of a critically ill or rapidly deteriorating patient in the ED can be exciting to some providers, anxiety-provoking to others. Regardless of your reaction, having the right tools available to treat that patient is paramount. Although not a “tool” in the common sense of the word, the team treating a patient is one of the mechanisms we can leverage to deliver optimal care. That includes nurses and techs that are skilled at their jobs and work together with the clinician leading the resuscitation. Other important tools in our treatment toolkit might include difficult airway boxes and specific expertise, ultrasound to help assess the patient and direct interventions, and invariably good vascular access along with an ability to rapidly deliver fluids and medications. Numerous studies have shown that vascular access is a recurring challenge in our patients.1-3 It’s not rare for providers to find themselves with a severely hypotensive patient and a single 20 gauge IV in place. What options do we have in such a case? Placing a central line may be tempting, but this will likely require two fluid and pressure bags to infuse fluid fast enough. A cordis introducer sheath could be placed and would allow for rapid fluid infusion; especially if a Level I type infuser is available. However, both options are quite time-consuming to perform, time a patient in hypotensive shock may not have. This frustrating situation is common and typically results in nurses or providers squeezing fluid bags or repeatedly inflating pressure bags, neither of which is fast. I personally see this daily in my practice and, each time, wish I had a better solution, as I squeeze fluid bags and pump up pressure infusers until my arms and hands start to cramp and spasm. This Neanderthal-like scene is repeated by me nearly each shift, all in an effort to reverse critically severe hypotension which I fear may quickly lead to an arrest if not corrected. The pressing need for rapid and “as immediate as possible” fluid infusion is what causes us to resuscitate infants with individual syringes or by using the push-pull method with a three-way stopcock. In larger children or adults, the volumes required are much larger and cannot be efficiently delivered by these methods. LifeFlow is an alternative rapid bolus tool, which is being used daily by early adopters who recognize its potential. The use of LifeFlow is presented below in a case which illustrates how rapidly patients can deteriorate when they are in severe hypotensive shock, then shows the marked impact rapid fluid infusion makes in correcting a life-threatening state. AH is an 18-year-old male who presented to the ED with abdominal pain, difficulty breathing, and difficulty swallowing after ingesting food containing tree nuts approximately 30 minutes prior to arrival. He took an adult dose of diphenhydramine prior to arrival but did not have his epi-pen with him. On arrival he was alert and awake, able to speak in full sentences and tolerating his secretions. Vital signs were noted as T 36.6, P 119, BP 136/92, RR 20 with 98% saturation on room air. He was seen immediately and treated with IM epinephrine 0.3mg, a 20 gauge peripheral IV was established and he was given intravenous solumedrol, normal saline, as well as additional anti-histamine. The patient had progressive subjective and objective improvement after this initial treatment. However, within 60 minutes after this treatment the patient’s appearance drastically changed and vital signs became acutely unstable. He began to wheeze, which prompted treatment with a nebulized beta-agonist. The patient’s heart rate increased to 130 bpm and blood pressure plummeted to 51/26 mmHg. He complained of vision loss while still supine and became less responsive. As endotracheal intubation was being prepared for, because impending arrest was feared, the patient was treated with 2 fluid boluses for a total of 40 mL/kg of IVF normal saline using LifeFlow. Each bolus was completed in just 4 minutes. Rapid improvement in the patient’s status caused providers to delay intubating him. Within 5 minutes the patient showed considerable improvement in mentation and vital signs, and his vision returned. 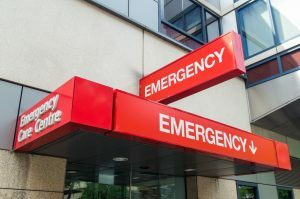 An epinephrine drip for his anaphylactic reaction was initiated while in the Emergency Department, which carried over to the patient’s first 4 hours of ICU stay. The patient was transferred to the ICU in stable condition and was there for less than 24 hours. During the patient’s ICU stay, he remained neurologically and hemodynamically intact and required no further intervention after 4 hours into his ICU stay. The patient’s epinephrine drip, solumedrol, and anti-histamine therapy were discontinued secondary to full recovery back to baseline. The patient received a total of 1 liter of D5W at 0.5 maintenance rate during his overnight ICU course. The following day he was transferred to stepdown for a total of 24 hours and remained stable with normal vital signs and unremarkable physical examination findings. It was determined at this time that the patient was safe for discharge secondary to full recovery. This case illustrates the impact of rapid fluid resuscitation in the critically hypotensive patient. The severe hypotensive shock exhibited by this patient could have led to rapid cardiovascular collapse and an arrest. Had intubation been attempted to protect the patient’s airway with such a low blood pressure, it would have markedly increased his risk for an arrest.4 With a peripheral IV as the only option, the ability to rapidly infuse adequate amounts of intravenous fluid and bolster the patient’s blood pressure was critical to his care. LifeFlow enabled providers to rapidly infuse two fluid boluses through a 20 gauge IV at a rate not possible without a cordis introducer sheath and Level 1®-type rapid infuser. In most ED settings, neither is a likely solution in the case of a rapidly deteriorating patient as described here. For providers, one of the most reassuring and gratifying measures of success of their interventions in a critically ill patient is to witness rapid, clinically obvious improvement, in real time. In this case, the providers saw the patient improve in front of their eyes and even decided intubation was no longer required. The patient’s vitals recovered rapidly and his severe neurological symptoms, which underscored the severity of his shock and proximity to cardiovascular collapse, resolved within minutes. The ease and success of a rapid fluid bolus in this case offers a stark contrast to the common scenario we often face where we’re struggling to infuse fluids by any means possible. The typical result is a frustrating prolonged wait to deliver meaningful volumes of fluids to patients that needed them immediately. LifeFlow essentially transforms the common and frustratingly small-bored 20 gauge IV to an effective conduit for rapid and precise fluid resuscitation. van Loon FHJ, Buise MP, Claassen JJF, Dierick-van Daele ATM, Bouwman ARA. Comparison of ultrasound guidance with palpation and direct visualisation for peripheral vein cannulation in adult patients: a systematic review and meta-analysis. Br J Anaesth. 2018 Aug;121(2):358-366. Park JM, Kim MJ, Yim HW, Lee WC, Jeong H, Kim NJ. Utility of near-infrared light devices for pediatric peripheral intravenous cannulation: a systematic review and meta-analysis. Eur J Pediatr. 2016 Dec;175(12):1975-1988. Bahl A, Pandurangadu AV, Tucker J, Bagan M. A randomized controlled trial assessing the use of ultrasound for nurse-performed IV placement in difficult access ED patients. Am J Emerg Med. 2016 Oct;34(10):1950-1954. De Jong A, Rolle A, Molinari N, Paugam-Burtz C, Constantin JM, Lefrant JY, Asehnoune K, Jung B, Futier E, Chanques G, Azoulay E, Jaber S. Cardiac Arrest and Mortality Related to Intubation Procedure in Critically Ill Adult Patients: A Multicenter Cohort Study. Crit Care Med. 2018 Apr;46(4):532-539.